There is so much talk lately about building value for patients. Value is the importance you place on something and the level of appreciation you have for it. So how do you build value for your patients? What can you do and say that will help your patients or potential patients value you highly? A good start is to think outside the box. Look at what you value and how you decide on products and services. What makes you the buyer, choose something over something else? Why do you pay more knowing that there could be a similar service you can get for less of a fee? Once you know the answer to these questions you can start to think about what makes your patients tick and why they make certain choices. You need to start thinking about this is your Dental Practice. Do you ever ask your long-term patients why they continue coming back to you? Your existing patients can help you understand what your patients value about you right now. You can then build on what you are already doing right. 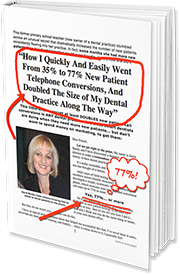 I believe that there are so many calls that come into your dental office and no one finds out what is important to the caller. If you don’t know what is important to the caller, how can you offer good value. This too me is one of the worst missed opportunities in your dental business and even worse a missed opportunity to help someone. Find out what is important to the caller. Start asking questions, listen and build the value based on what the caller wants not what you think they want. This is how you truly build value. Now you can do this with your existing patients. Often when you are talking to patients and making suggestions to help them, they begin to realise what else is important to them. You can now match what is important to your patient. When people see the value, they say yes and feel good about their choices. When they say no it is often because you haven’t built this value for them. You need to help your patients see the value. This should be and has to be part of what you do to help your patients. My next public speaking event is my live full day Workshop with Dr David Moffet from The Ultimate Patient Experience. The next Master Class in Melbourne is “How to Turn Every Dental Phone Call Into A Valued and Kept Appointment” on Friday 31st August 2018. Click here for information on Melbourne. Brisbane Master Class- Friday 12th October 2018. Sydney Master Class- Friday 16th November 2018.